The countdown for Plastivision Arabia 2016 has begun. Having firmly established itself as the best regional sourcing point within the GCC with its past two editions, Plastivision Arabia is gearing up for its third edition, which will be take place in Sharjah, UAE, from February 22 to 25, 2016. Like its previous two iterations, the plastics expo will be held at Expo Centre Sharjah, a premier exhibition facility in the UAE, known to host the region's most popular trade exhibitions and some of the top-of-the-range, highly focused B2B and B2C shows. To be held along with Plastivision Arabia is Arabiamold 2016, a premier international trade fair for mold-making, tooling, design and application development. The importance of the GCC as a work and travel destination has increased with the announcement of world events like the World Expo in Dubai in 2020 and the FIFA World Cup in Qatar in 2022. The GCC has always placed huge emphasis on tourism and real estate and the All India Plastics Manufacturers Association (AIPMA), the organizers of Plastivision Arabia, look to capitalize on the fast-expanding construction and packaging industries in the region, which offer prospects for tremendous growth. Plastivision Arabia 2016 aims to provide regional manufacturers instant access to new machinery, technologies and materials. In an interview with Lekhraj Ghai of POLYMERUPDATE, Harish Dharamsi, Chairman - Plastivision Arabia 2016, discusses the highlights of the upcoming event and the opportunities that the GCC region presents for plastics industry professionals. LG: What is Plastivision Arabia all about? How is it different from Plastivision India? HD: Plastivision Arabia is AIPMA's initiative in partnership with Expo center, Sharjah—an arm of Sharjah Chamber of Commerce—to provide an opportunity for Indian manufacturers to showcase their products and services to the Middle East and African markets. Plastivision Arabia 2016 will place special emphasis on processing, filling and packaging and decision makers from the regional processing and re-packaging industry will be visitors to the show. The steady rise in demand for finished plastics products, which is set to increase further on the back of a growing economy, rising consumer sentiment and a slew of mega events across the region, has prompted us to host a special pavilion "Plastiworld" featuring an extensive range of finished plastics products. Plastivision India, on the other hand, is meant for the Indian market. LG: What are the advantages that Sharjah offers for plastics industry related events such as Plastivision Arabia? How supportive is the government of UAE for such international trade shows? HD: Sharjah is a manufacturing hub in the UAE and is home to major polymer convertors. Moreover, their government is very supportive and has partnered this event through the Sharjah Chamber of Commerce. LG: What is the expected number of exhibitors and visitors in Plastivision Arabia 2016? HD: We are expecting 250+ Indian exhibitors and 10,000+ focused visitors from across the world. LG: How much business does AIPMA expect to generate through Plastivision Arabia 2016? HD: During Plastivision Arabia 2014, all the machines displayed live were sold. Naturally, we expect to do more business this time around. LG: How has participation from China been in this edition of Plastivision Arabia given the slowdown in China's economy? HD: Participation from China and Taiwan has in fact increased many folds in Plastivision 2016 as they feel that the GCC market is still vibrant with upcoming global events like the World Expo 2020 and the football World Cup. LG: How intense is competition within the plastics industry exhibition space? What are the highlights of Plastivision Arabia 2016 that will set it apart from other similar events? HD: Today, competition exists in every field and we strive to set high standards within the exhibition space. To attract quality and focused visitors, we have worked out a VIP Buyers program in various GCC and African countries with the help of local associations, in which we offer to pay for the airfare for selected visitors. LG: Has there been a change in the space allocations as compared to Plastivision Arabia 2014? HD: Many of our exhibitors are already asking for increased space. Participation from China and Taiwan has also increased exponentially. Our marketing efforts have attracted exhibitors from European countries also. If the situation demands, we may open up one more hall to incorporate the increased number of exhibitors. LG: How will Plastivision Arabia enhance growth in the Indian plastics industry? How does it contribute towards the Prime Minister's "Make in India" initiative? HD: The GCC countries have been traditionally considered as Indian market and showcasing there increases Indian exports. After our Prime Minister's UAE visit and assurance from the UAE government of enhanced investment in India, many state governments like Bihar, UP, Odisha and Himachal Pradesh are joining as State Partners and will showcase investment opportunities in their respective states. LG: What are your views on environmental sustainability and plastics recycling? What efforts are being taken by AIPMA to address environmental challenges through Plastivision Arabia? HD: AIPMA hosts a recycling pavilion in Plastivision and educates visitors about latest developments in recycling and waste management. We also have a "Medical" pavilion, which highlights the use of plastics in the medical field. This particular pavilion attracted 25% of the total visitors with genuine enquiries in the previous Plastivision Arabia exhibition. How important are concurrent events like Arabia Mold for the success of Plastivision Arabia? HD: Moulds are an inseparable part of the plastics processing industry and hence a mould show always complements a plastics show and are beneficial for each other. LG: Are there any existing trade barriers that deter plastics trade between India and the Middle East? HD: There are no trade barriers between India and the GCC countries..
LG: Tell us about your company Aryavart Chemicals. HD: Aryavart Chemicals is into the manufacture of PVC Stabilizers and One Pack systems. It is a trusted name in the PVC processing industry since 1974. Our products are exported to many countries and our associate maintains stocks in Dubai to ensure timely deliveries in any quantity. Harish Dharamsi is a past President of the All India Plastics Manufacturers' Association (AIPMA) and Chairman of the 3rd Plastivision Arabia 2016. He has vast experience as a businessman and has made rich contributions in different capacities at AIPMA and other organizations. As AIPMA President he led delegations to UAE, China and Germany. Mr. Dharamsi has been a member of the National Governing Council of CIPET, a premier plastic training and research institute in India set by the government of India. 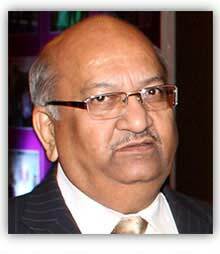 He has also been a member of the National Council of CII (Confederation of Indian Industries) and a member of Working Group on petrochemicals set up by the government of India. Associated with the paints and PVC industry for more than 35 years, Mr. Dharamsi is Director at Aryavart Chemicals, a leading manufacturer of PVC stabilizers.